There are 14 species of monkey in the park, from the achingly cute little Goeldi’s marmoset, to the black, long-limbed Peruvian spider monkey, but the king of the swingers has to be the red howler monkey, which has a lovely orange coat like an orang-utan and a loud, roaring call that can be heard for miles around, earning it the title of the loudest land animal. 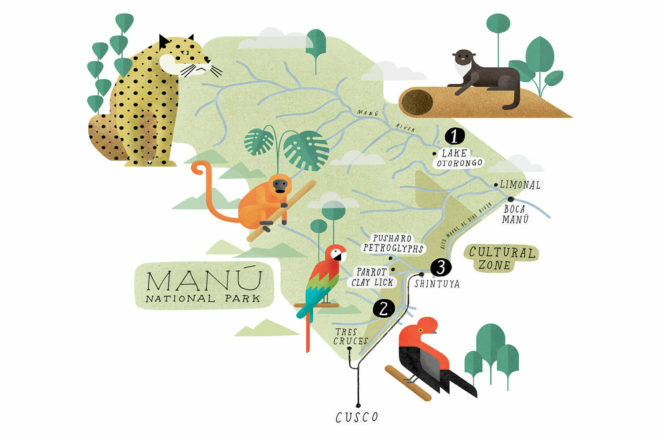 Manú is one of the best places to catch sight of South America’s iconic big cat and the best time to spot the jaguar is in May, June and July. This is when a wave of cool air rises up from the Atlantic and hits the Andes causing it to snow, which in turn swells the rivers of the Amazon leading to cooler temperatures in the basin. Animals like tapirs come out to forage in the cooler climes, which also coaxes their predators: the beautifully patterned jaguar. It’s the heaviest snake in the world and one of the longest, growing up to five metres in length. These shy animals can be found around lakes and swamps, but are hard to spot owing to their dark, banded camouflage. The immense size of this snake, which crushes the life out of its prey, perhaps gave rise to the myth of the 50-metre long giant anaconda of the Amazon. Take a guided night walk and you may spot some spectacular technicoloured creatures like the beautiful Manú poison frog, a type of ‘poison dart frog’, so called because indigenous hunters lace their blow darts with the frogs’ toxic secretions. A conservation effort: One of the biggest threats to the wildlife of Manú is gold mining, a destructive process that has seen a significant rise in the surrounding Madre de Dios region. It involves clearing forest from riverbanks and the dumping of mercury into rivers; contaminating the fish that are a source of sustenance to people and giant otters alike. Giant otters are already endangered, having been hunted for their pelts in the past, and Manú National Park has become a critical habitat for the apex predator. This year, a five-year research and conservation program has been launched in the region by San Diego Zoo and Oxford University. Based out of the national park, the research will help ensure the otters’ long-term survival, their existence vital for the health of the river ecosystem. Want to get the most out of your trip to Peru? Visit 7 must do experiences for more!